If you have been a reader for a while now, you would know how much I love old school methods. 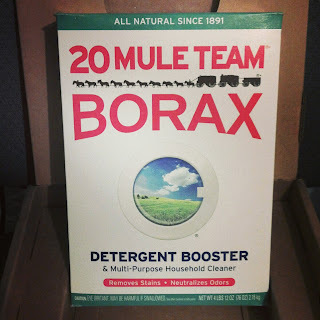 I received a box of Borax Detergent Booster and after reading the box alone I asked myself, "Why on earth have I NOT been using this stuff all these years!". I remember always seeing a box in the laundry room growing up, as I'm sure most of you have. I think I always associated Borax with only laundry. Turns out, there are many uses. You can use it to clean garbage disposals and drains, dishwashers, carpets and rugs, toilet bowls and of course, for laundry. It softens hard water so it enables your laundry detergent to do what it's supposed to do... clean your clothes. I added a 1/2 cup of Borax along with my regular detergent to a load of whites. I noticed how much brighter they were and the best part was there was no bleach scent left behind. Borax is 100% natural and I will be replacing my bleach with it for my whites. Borax works in all machines as well as with cold water. I still can't believe I have not been using this stuff all this time! You can't ever go wrong with old school, multi-purpose and affordable! Giveaway is open to US Residents only and will end on January 19, 2013. Three winners will be chosen at random and will be contacted via email. Momfiles is not responsible for any lost or stolen prizes. Good luck! I received products samples for review purposes and was supplied with FREE product coupons to give away. All thoughts/opinions are always my own. I've heard so many good things about Borax. In fact, it seems to stay sold out at the stores on my end of town. I'd love to try it to help brighten up my laundry because bleach can be damaging to clothes over time. I'd use it to clean my carpets. I plan to use it in my laundry. Funny you did this today...i just made slime with kiddos today and 1tsp of borax is used...i have found a bunch of "sciencey" stuff to do with them that uses borax. Borax has so many uses from cleaning your home to laundry...good stuff and inexpensive. To help boost laundry stain fighting! I would use it on the carpets. I would use it for the laundry, but I'd also try it on the carpets. I plan to use it as a laundry booster. I would use it on laundry as a substitute for bleach. Bleach doesn't only make the clothes stink, it makes the house stink. in my laundry, getting rid of the stains hubby gets on his clothes! lol. I will use it at a laundry detergent. I want to use it as a dishwasher detergent booster.